Charles and Margaret Ross with baby Arrabella. Margaret Ross, from Elgin, gave birth to her fifth child Arrabella less than a week after Dr Gray’s Hospital was downgraded due to the on-going staffing crisis. 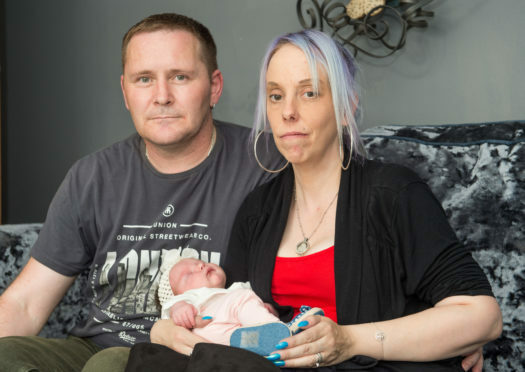 During the journey to the Granite City she was told to “stop pushing” by ambulance staff amid fears her baby would have to be delivered en-route. The 39-year-old was also forced to endure the final stages of the 65-mile journey without pain killers after supplies ran out. The mother-of-five was originally due to give birth at the town’s Dr Gray’s Hospital until plans changed when the unit was downgraded. An appointment was made for her to be induced at Aberdeen Maternity Hospital, only for Mrs Ross to then be rushed to Aberdeen in an ambulance after she went into labour two days early. It is understood that NHS Grampian are to contact her directly to discuss her experiences. Mrs Ross said: “It was horrific. Absolutely horrendous. “Just as we were coming into Aberdeen the midwives asked me to stop pushing. “I was strapped-in the entire time. During labour you have to move around and I just couldn’t. I’ve still got bruises on my legs. “I’ve had four pregnancies. I’ve had to be transferred to Dundee with premature twins and had a baby moved with forceps but this was the worst childbirth I’ve had. It was a heartbreaking thing to go through. “I don’t think Aberdeen can cope either. “The midwife had to leave another woman in labour to see me when I came through the door and then I was left for two hours after giving birth. Mrs Ross’ husband Charlie drove behind his wife’s ambulance all the way along the A96 Aberdeen road with no way of knowing her condition. Arrabella was delivered in Aberdeen in the early hours of July 25. She is now doing well at the family home in Elgin, surrounded by big brothers Cameron, Laughlan and Louis and sister Alexis. Kirsty Watson, a member of the Keep Mum campaign group, explained that Arrabella was an example of a baby that did not have to be delivered in Aberdeen. NHS Grampian has stressed that a staff shortage at Dr Gray’s means transfers to Aberdeen or Inverness will remain the safest option for medium and high-risk pregnancies.